with Kyle Connecticut, Luc Rioual, Migzy, Michael Bozzuto, Mike Tobey & More! 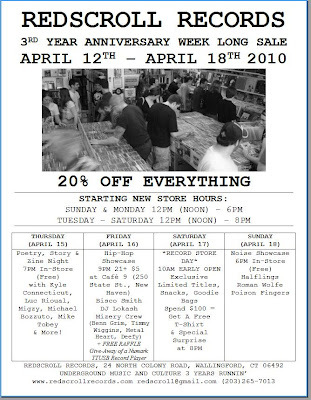 Tomorrow is the big event: RECORD STORE DAY & 2 YEAR ANNIVERSARY CELEBRATION! We are running a one day sale of 20% Off of EVERYTHING! We spent a few hours last night putting together a hundred goodie bags that have a variety of treats in them – first come, first served. We’ve got a ton of exclusive Record Store Day titles (LISTED BELOW!). If you spend over $100 you get a Redscroll T-Shirt of your choosing. We’ve also got a few nice surprises in store (in the store). It should all be really fun. Please do not call or write asking for holds – it can’t be done for this stuff. One per customer as well – in the spirit of fairness to all.